Hali Haber (left), director of campus programming and strategic relationships for CAMERA, and Aviva Rosenschein, CAMERA’s international campus director. Credit: CAMERA on Campus. For most college students, summer is an opportunity travel, hang out with friends or land that exciting internship. 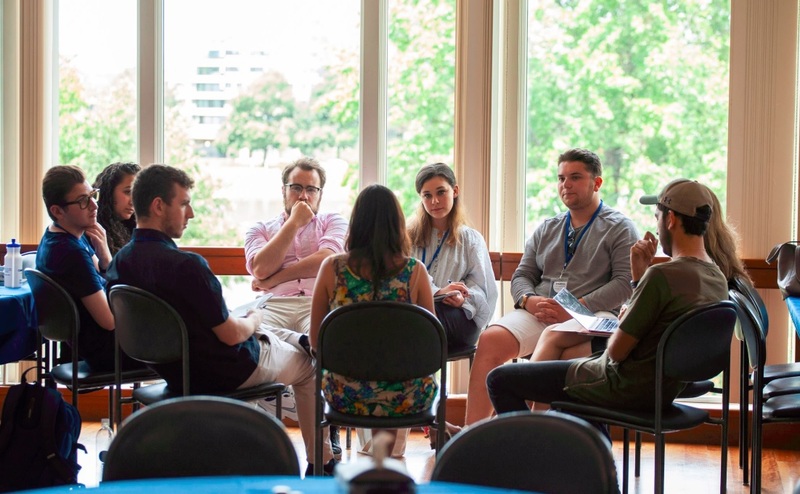 But for more than 80 students from nearly 70 campuses, learning how to successfully respond to campus antisemitism and anti-Israel activism was part of their summer plans. 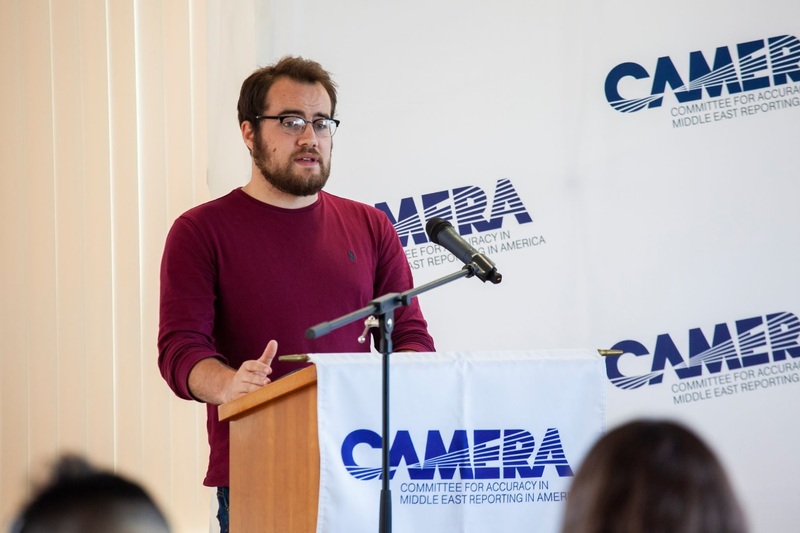 Earlier this month, the Committee for Accuracy in Middle East Reporting in America (CAMERA) hosted a four-day conference in Boston replete with lectures, discussions and workshops guiding college students to become more effective supporters of the Jewish state. This year’s conference included a wide range of lessons and activities — from activities like Krav Maga lessons and an indoor trampoline park to dealing with more serious campus issues, such as the evolution of the BDS movement, anti-Israel groups and anti-Semitism. The goal was to empower students to speak up more, write more powerfully and craft their own personal narratives. Part of the goal of this year’s conference was to address the changing environment on campus for pro-Israel and Jewish students. In the last several years, a great deal of focus has been places on the ongoing battle against the BDS movement. And rightly so, according to those involved in combating the ideology of these groups; during the past year, Jewish-led anti-Israel groups, such as Jewish Voice for Peace and IfNotNow, have started to penetrate into the campus scene, summer camps and Israel trips. As such, CAMERA’s campus staff sought to address this emerging challenge and have changed their conference to reflect this new reality. One of the biggest changes to this year’s conference is the shift away from a heavy focus on the battle over BDS resolutions and a more direct emphasis on educating students on these anti-Israel Jewish groups. “We’ve found that BDS supporters are enacting new tactics on campus, in addition to their resolutions, which are even further targeting and discriminating against individual Jewish and Israeli students,” Hali Haber, director of campus programming and strategic relationship at CAMERA, told JNS. One of those changes was to drop the BDS mock trial, where students role-play opposing sides of a BDS resolution vote as part of a campus student council. This doesn’t mean that BDS resolutions are no longer a focus. Haber said that BDS resolutions are becoming more complex and specific. “It is a lot harder to pass BDS resolutions now, so the BDS proponents have to find a way more indirect way to bring BDS to campus without it directly saying that,” said Haber. So in addition to looking more in-depth into BDS resolutions, students also spent an entire afternoon learning more about anti-Israel groups on campus, such as Jewish Voice for Peace, Students for Justice in Palestine and IfNotNow, as well as a new campaign called “deadly exchange,” where anti-Israel groups talk about how police in America are being trained by Israel and how that affects American police treatment of minority groups here. Rosenschein told JNS that one of the biggest challenges pro-Israel Jewish students on college face today is strong opposition to Israel from groups comprised of anti-Israel Jews. She pointed to Jewish Voice for Peace, which has been around for many years as a national organization, but has more recently began establishing more chapters on campus. Rosenschein said groups like JVP and IfNotNow, the latter of which has many Jewish students as members and emerged onto the campus scene in the past year, make it difficult for Jewish students to figure out where to stand because they mask themselves as organizations standing for peace, which appeals to students, but are very much out of the mainstream. “This is a fringe group [JVP] that is very far out of the mainstream Jewish community,” she said. Beyond the American campus, CAMERA brought in international students this year from Canada, the United Kingdom and Ireland to discuss their experiences and challenges there. Daniel O’Dowd, a law student at Ireland’s Maynooth University and president of Irish Students of Israel told JNS that his group faces an enormous challenge from pro-Palestinian groups. Indeed, Ireland is regarded as one of the most anti-Israel country in the European Union. In fact, the Irish Senate recently passed a resolution to boycott Israeli settlements — the first such measure within the E.U. Daniel O’Dowd, a law student at Ireland’s Maynooth University and president of Irish Students of Israel speaks about the harsh realities of being pro-Israel in Ireland. Credit: CAMERA on Campus. Much of this sentiment O’Dowd said stems the conflict in Northern Ireland, where those advocating for an end to British rule see solidarity with the Palestinian cause. “The Nationalist Republican community very strongly identifies with the Palestinians, who are seen as the underdog, while the Unionists [who support remaining in the U.K.] are very pro-Israel,” he said. He has been working with CAMERA over the past year for support and to bring in pro-Israel speakers and events, and hopes that more Irish will understand that similarities between the Irish struggle for freedom and that of Israel’s self-determination. Amid the challenges students face by the BDS movement, pro-Palestinian groups and anti-Israel student groups, there is also the issue of being openly pro-Israel while identifying as politically liberal or even a progressive. This is a dilemma faced by many students, who are often forced to choose between supporting progressive politics or supporting Israel. At this year’s conference, CAMERA sought to address this by beginning in Amanda Berman, co-founder of the Zioness Movement, a progressive Zionist group. She told JNS that many liberal Zionist students feel alienated on campus and find themselves forced to make a false choice between Jewish/Zionist identities, and their progressive and activist identities. 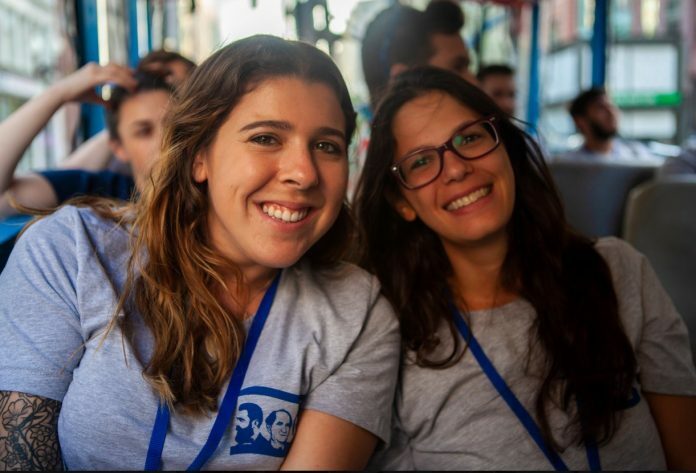 “It is a heartbreaking dilemma for them because they see a natural alliance between those two inherent parts of their being: their commitment to tikkun olam informs and empowers them in their activism and their desire to fight for progress,” she said. In recent years, a number of liberal arts colleges have become hotbeds of anti-Israel activism. Swarthmore gained headlines in 2013, when the school’s Hillel declared itself an “Open Hillel” and not abide by Hillel’s ban on hosting anti-Israel speakers. Eventually, after pressure from its former parent organization, Hillel International, they dropped the Hillel name altogether and changed their organization to Swarthmore Kehilah. Similarly, Jesse Friedson, a student at nearby Haverford College, said he has found it much easier to be a queer student than to be a Zionist. “I would like to be more of an Israeli activist on campus, but socially, that is a very difficult decision to make. As I have come out of my shell more and posted on Facebook, I have started to get a reputation. And I think it is unfortunate that I have to choose between something I believe in so strongly and having friends,” he said. Friedson believes that among progressives, there has been a trend of applying a moral label of good versus bad off an individual’s political beliefs. Jesse Slomowitz, a senior and film major at the University of Central Florida in Orlando, who had previously attended the CAMERA conference and returned to assist, told JNS that he was impressed with this year’s cohort. “The number of people involved with CAMERA is expanding,” he said. “The positive side is that I am seeing more students involved, but the downside is they have more reasons for joining. Slomowitz said at the end of the day, every student will contribute in his or her own unique way to be an advocate for Israel. “The thing is there are different ways to be out there being an Israel advocate, and students need to realize that. If sometimes you have to be that person debating, that’s great, but for others, that may not be their strength. They may be stronger in writing, debating online or managing an organization.